JAM Project, one of the biggest anisong “supergroups” in the industry, was founded in order to further the genre of anime songs specifically. 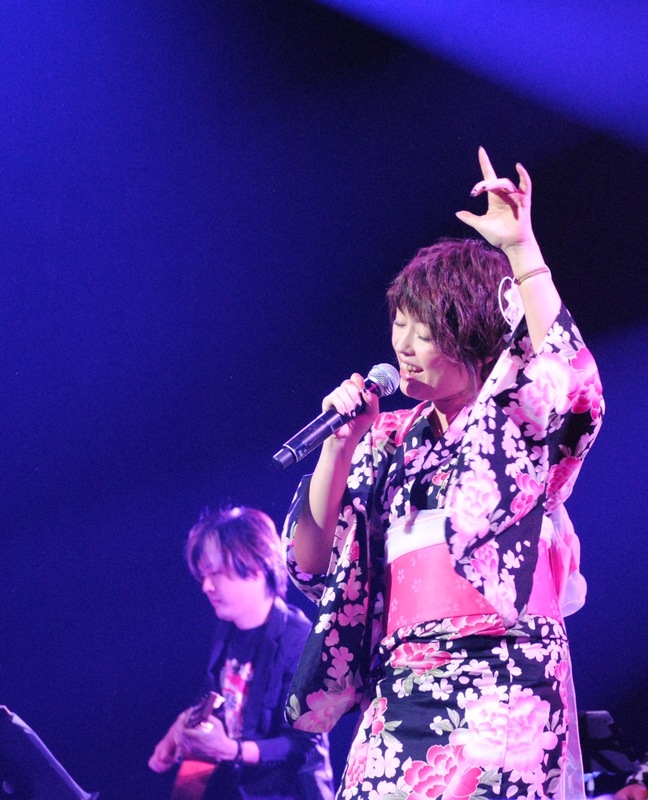 Consisting of a number of veteran anisong singers, today it now comprises founding members Masaaki Endoh and Hironobu Kageyama, as well as Masami Okui, Hiroshi Kitadani, and Yoshiki Fukuyama, who all joined between 2002-2003. They are best known for songs for shounen action shows such as Cardfight Vanguard, Nobunaga the Fool, GARO, and New Getter Robo, as well as video games like Super Robot Wars. Their operatic rock seems to fit those genres especially well. Unfortunately, the audio for our transcript recording was sometimes fuzzy so not all attributions were 100% clear. Apologies for lack of clarity on those questions and answers. We started by asking Masaaki Endoh about his famous predilection for bringing instant noodles with him on tour. Endoh-san, what kind of instant noodle did you bring this time? Masaaki Endoh: Six different flavors of mini-sized ramen! But I don’t have a water boiler due to luggage weight limits, and unlike in Japan, they don’t have hot water dispensers in every room. Your stagecraft and style of music is very theatrical and almost operatic. Is that a reflection of the sort of anime that you do music form or is that your natural style? Hironobu Kageyama: Actually it is influenced by the type of anime the songs are for. So if it’s anime that has robots, like Super Robot Taisen where there’s a lot of fighting and energy, the songs will be influenced by that. How do you think your style has adjusted over the past 15 years? Kageyama: We don’t so much change our style as look for something new to do. So would you ever do a song for a moe anime? How do you relax when you’re off jam project? Individually? Or collectively? Kageyama:We always like to talk together sometimes. Outside of music…well, we always thought about making our own jam. Jam Project jam! What secret hobbies or hidden talents do you have? Kageyama: I’m the oldest, so working out is my hobby. Recently I’ve been cycling and scuba diving. And this year, I’m challenging myself to train for a short distance triathlon. Hiroshi Kitadani: The fans on twitter probably already know this, but my hobby is cooking. I do it every day, and when I make my own dish and drink alcohol, it’s very relaxing and therapeutic. Kitadani: Oden! It’s easy to make. Masami Okui: As for [my hobbies], in Japan or all over the world, I like to visit “power spots”–places with spiritual energy. In Japan, that would be shrines or temples I love. When I’m off work, I go there a lot. This year, though, I want to go to Mt. Shasta. Yoshiki Fukuyama: I have no hobby. So my hobby now is to look for a hobby. Endoh: I love animals, so I have a lot of pets. It’s a dream that I want to be surrounded by animals in a big place. Kageyama-san, you said last year at Anime Boston that you started the band when anisongs were in decline . Do you think the anisong industry has revived since then? Where do you see it going? Kageyama: Anime songs are much more popular popular in Japan compared to 10 years ago. There are a lot of live events and concerts now and the audience has increased a lot. And variety of artists have shown up. So, it has changed a lot over the course of 10 years. Who is the first musical artist that grabbed your heart? Kageyama: I love Motley Crue. Fukuyama: I love Deep Purple. Okui: I love Kageyama’s vocal band, Lazy. Endoh: I love the Beatles. You’re all at Las Vegas now, do you plan to gamble and do you feel lucky? Okui: Living is a gamble. Kageyama: I don’t feel the urge to gamble. But if I was, I’ll pull a slot machine handle once. Fukuyama: I never tried gambling, but I have seen it a lot in movies, so I like to try it like they do it in the movies. Endoh: I like hitting the jackpot. You’ve done a lot of songs for sentai series. What are your sentai colors? Kitadani: [points to Kageyama]: He’s red. Kageyama: Oh, I’m red, huh? Endoh: I like red, but red’s been taken, so I’ll be green. The interview was conducted by Jeremy Booth with additional questions by Michael Huang. Rome Yamashita, Raymond Hu, and Linda Yau translated from the audio for this transcript. When did you decide to sing anime songs? When there was an anime singer contest. I auditioned for that–and won! The Grand Prix 1990, right? What was your winning song? The assigned song was from Maple Town. And the free song I chose was by Imai Miku. What was like to prepare for your recording debut with “Otome no Policy” (the Sailor Moon R ED)? At the vocal booth, I entered alone. It’s a solitary process, so when I record a vocal, I imagine that I’m singing in front of a huge audience. I get nervous every time! You’ve done a lot of songs. How do you choose which ones to do at each performance? For example, like this performance in Vegas or elsewhere abroad, I choose whatever songs are popular in that local area. And I also take into account what songs fit in outdoor or indoor venues. I don’t have any…[but] I love traveling abroad privately. Now I go abroad for work, but since I love traveling, I still feel happy. Can you tell me which anime moved you emotionally? My debut song was in Sailor Moon, but recently I was moved by Strike Witches. Those girls work so hard. They fight hard and build their friendship, and that kind of story moves me. How do you translate those feelings into a performance? Many times that the lyrics tells a story and the girl’s emotion, so when I sing, I put emotions into the lyrics, and I remind myself of the first scene [in the story], which raises the right emotions. I love your opening for Shirobako, “Colorful Box.” Based on what you know, how realistic is that show in showing the anime production process? The people I know in the industry say “oh yeah, that’s true, that happens!” when watching that show. So I think it’s close to reality. What other anime you watching? I don’t watch a lot recently, but I did enjoy watching Strike Witches. Who is your first music love? My mother loved old Japanese pop songs. Lyrics were sung very clearly in the old days, so now I sing lyrics very clearly too. Do you plan to gamble tonight? Yes, on the slot machines! Michael Huang conducted the interview, with assistance by Jeremy Booth. Raymond Hu provided on-site translation. The full interview was translated by Rome Yamashita. ChouCho is the singer of many recent anisongs, including songs for Fate/kaleid Liner Prisma Illya, Heaven’s Memo Pad, Glasslip, and Mashiiro Symphony. 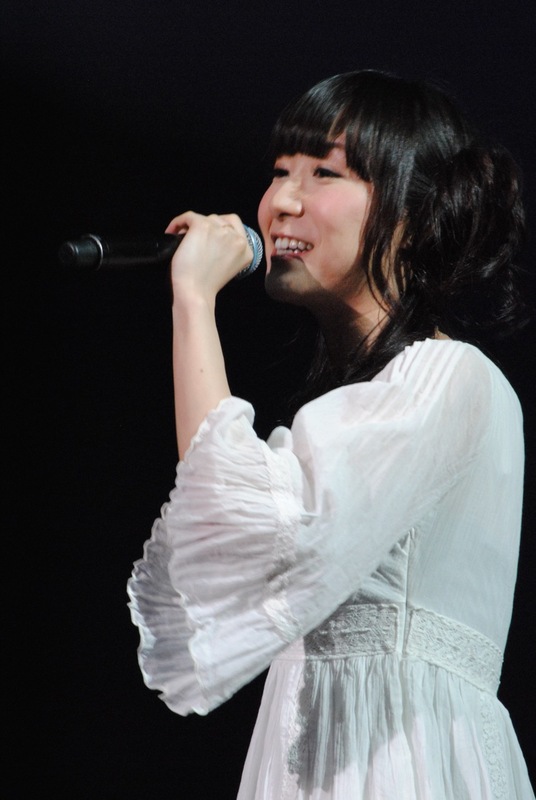 She got her start singing Vocaloid covers on Nico Nico Douga and quickly established a successful solo career in recent years. What do you think about size of the food here in the US? It’s double the size of Japan’s. Aside from American food, we understand you’re from Osaka. What kind of food from Osaka do you like? I want to eat takoyaki sometimes! Let’s go back to the start of your career. You sang anisongs even as early as high school.What anime did you like back then? I used to copy J-pop songs then [actually]. After graduating from high school with the band I had, that was the first time I copied anime songs. Evangelion and Aquarion–songs by Yoko Kanno and Maaya Sakamoto. What inspired you to post videos on Nico Nico Douga? When I was in an anime song cover band, we entered a local anime song event in Osaka. And the other band’s vocalist was posting their songs on Nico Nico, which was the first time I heard about anyone doing that. That inspired me to do the same. Any particular Nico Nico artists you liked? Hatsune Miku is a machine, so it doesn’t have emotion. Even without vocals, the song itself has enough charm to convey [emotions] directly, so when I did the cover, I was thinking a lot about how to convey the charm of the songs through my performance. Tell us about how you got chosen to do the KamiMemo OP. They were looking for a singer to do OP for KamiMemo, and I was selected from various candidates. They saw my NicoNico videos and that’s how I got vetted, and I feel I was very lucky. How do you prepare for a performance like the one you just did? I practiced at home a lot, and practiced English MCing. I studied English in Canada for a half year. But that was 5 years ago, so I almost forgot all my English. It’s been a long time since I went over English and I was nervous about it. The anime you sing for features a lot of cute girls. Who are your favorite cute anime characters? It’s difficult to say! I put a lot of energy into each anime I sing for, so it’s hard to choose. If I have to choose, it’s Alice from KamiMemo. Do you have any image in your head when you sing? Since it’s main theme song, I have to become the character’s feeling, in order to express. How’s your pet rabbit Sanagi doing? It’s very cute and tsundere! Normally, it’s cool (tsun), but when it’s hungry and begs for food, it’s cute (dere). How did you name Sanagi? What message do you have for your American fans? I now understand that our songs are loved even across international borders. Through this concert, I will try our best, so we can come back to the USA again. So, last question: are you gonna gamble here in Vegas? Probably, if I have time tonight! Michael Huang conducted the interview, with on-site translation help by Raymond Hu. Rome Yamashita translated the interview from the Japanese.